Welcome aboard our flagship canal boat. Packed with every possible amenity for a superior sleep, cabins are designed for optimal space and serenity on the French waterways. Pen the day’s delights at your sun-dappled writing desk, or dream the day away on your plush double bed. Pamper and prep in the elegant en-suite before cocktails on deck. Our spacious twin or king cabins feature their own indulgent en-suite bathroom, large scenic window and controlled heating. All six cabins can be reconfigured to your needs––the perfect choice for groups or families. 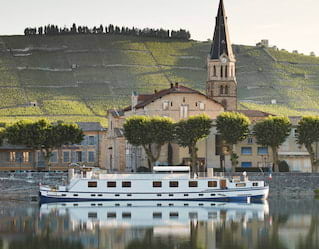 One of the last commercial barges to have been built, Belmond Napoléon was converted into a luxurious péniche-hôtel in 1963. She remains a shining star in our fleet and adheres to sound environmental principles; recycling water, using smart batteries and other eco-friendly measures.